Find My Workspace lists over 95% of the executive office suites market in Antioch (California). Simply click Request Quote to check pricing for one office, or Add to Basket for multiple offices. 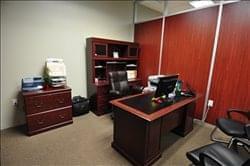 This office is a full service office space located in Antioch, CA. providing permanent, as needed office space, and virtual office for rent. The day office is fully furnished and it can hold up to four people. The Conference Room can accommodate 10 people. Both Day Office and Conference Room are available on an hourly, ½ day, and full day rental. The hourly rental is great for small businesses that have an occasional need for an office space to meet clients. Add the Virtual Office mail plan, you can operate a business at home and still project a professional image at a professional business address. All for a much lower cost than if you would have a permanent office space. For the ultimate experience for your customers, the Live Receptionist service can handle your calls, route your calls to where ever you want, take messages, and make appointments for you. Just tell us how you want us to handle your calls and we will do the rest.